We are pleased to announce that Merchants Moving and Storage has joined forces and is now part of the Budd Van Lines Family. Same great people, same great service, greater nationwide coverage! eCrates are a green alternative to cardboard cartons. Merchants has the knowledge and equipment required to professionally handle your office moving needs. Whether moving to a new location, a new suite in the same building, or something in between – Merchants will take care of your needs – efficiently and proficiently. Our specialized office relocation coordinators work with you to plan every detail of your office move. We have a dedicated team of professional, full-time movers. The years of experience and attention to detail they have ensure a successful, stress-free relocation while minimizing down-time. We can take care of disassembling/reassembling any cubicle! 5-star rated office move consultant – they’ll plan & manage every detail to ensure a successful office move. Dedicated move coordinator to act as your single-point-of-contact, making communication smooth and hassle-free! Exceptional, well-trained crews will pack, load and transport your office. 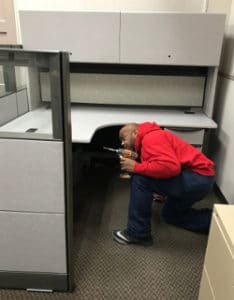 These folks are experts at modular office furniture disassembly and reassembly! Your office items will be unpacked to order in your chosen locations at your new office. All while ensuring your down-time is minimal and getting you back to work sooner! We also offer secure file relocation and storage if needed. 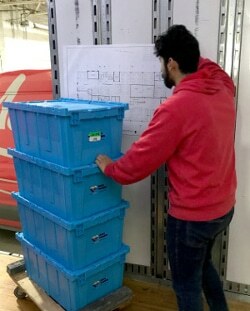 Proper planning and placement at delivery is crucial for a smooth office move. We understand how important your office moving or commercial moving project is. It’s crucial that the move goes smoothly and you can count on Merchants to make sure it does! We’re serious about the quality of our work and our commitment to your satisfaction. 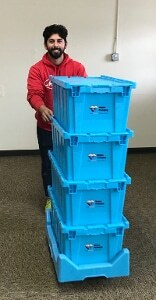 As an office relocation customer you’ll enjoy the same high-quality, award-winning commercial and corporate moving and storage services that Merchants’ has staked its reputation on for more than 95 years. Ready to start the process? Fill out our Request an Estimate form, and we’ll contact you! Next Step: Contact us for a complete list of services and pricing at 262.631.5680 or reach out electronically through our online form. "Dave, Mark & Bryant were wonderful to work with. I haven't unpacked all boxes yet, but I feel confident that everything will be intact. Considering all the horrible stories I heard about moving, Merchants made it seem easy. Thank you!" "The guys were absolutely phenomenal. This was my 1st move with zero issues during and after the move. The house and the items we handles with care and they were very thoughtful. A++!" "Everything went extremely smoothly. Everyone was so nice and polite. Things were moved quickly and professionally. Our items were held for about 2 days which helped us in our move. So convenient for us. Thank you!" "Moving is stressful. However you made it much less stressful for us, The crew was AMAZING!!! Friendly, professional, and extremely good at their job. Everything was packed beautifully and labeled SOOOOO good. Just a great experience. THANK YOU SO MUCH!!" Discover why clients recommend Merchants, and get started with a quote for moving your household goods.